The world continues to be a very dark place, as the ongoing discussion of what level of alleged sexual assault is tolerable for a Supreme Court nominee can attest. And let’s not forget that we’re on the verge of another government shutdown if Congress can’t pass a crucial spending bill by September 30, because the GOP and the White House would rather continue to allocate a disproportionate amount of funds to the already bloated defense budget than support women’s medical health services. 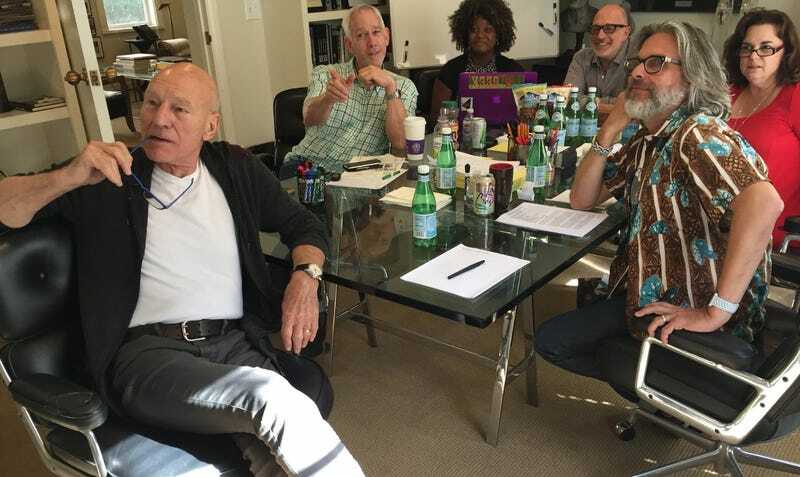 There’s not much info available about the new CBS All Access series, but Stewart will reprise the role of Jean-Luc Picard in this Next Generation continuation series, which is being written by Kirsten Beyer, Michael Chabon, Akiva Goldsman, Diandra Pendleton-Thompson, and James Duff. According to Deadline, Alex Kurtzman, who took over as Star Trek: Discovery showrunner earlier this year, is overseeing the new, as-yet-untitled series’ development. If you still need cheering up, here’s a photo of Stewart dressed as a lobster for Halloween (we assume). Is there anything this man can’t do?